This made me smile Diane - since my sister has a real “issue” with spiders! Love the word spiderlings. Spiders and I cohabitate, but aren't best friends! 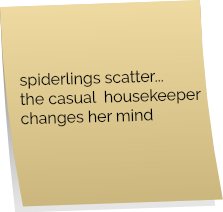 Changes her mind and decides to let them live because they're so dang cute...or changes her mind and becomes a neat freak, hunting down and vacuuming up every last one? I hope the first! That's the beauty of haiku brevity--no space to explain, no telling the reader how to think!